Is there a national dance in the US? No, claro, los gringos aren’t very good at dancing. This was my excuse this weekend when I was asked that question. But the truth is, Chileans aren’t always good at dancing either. It doesn’t stop them from trying, though. 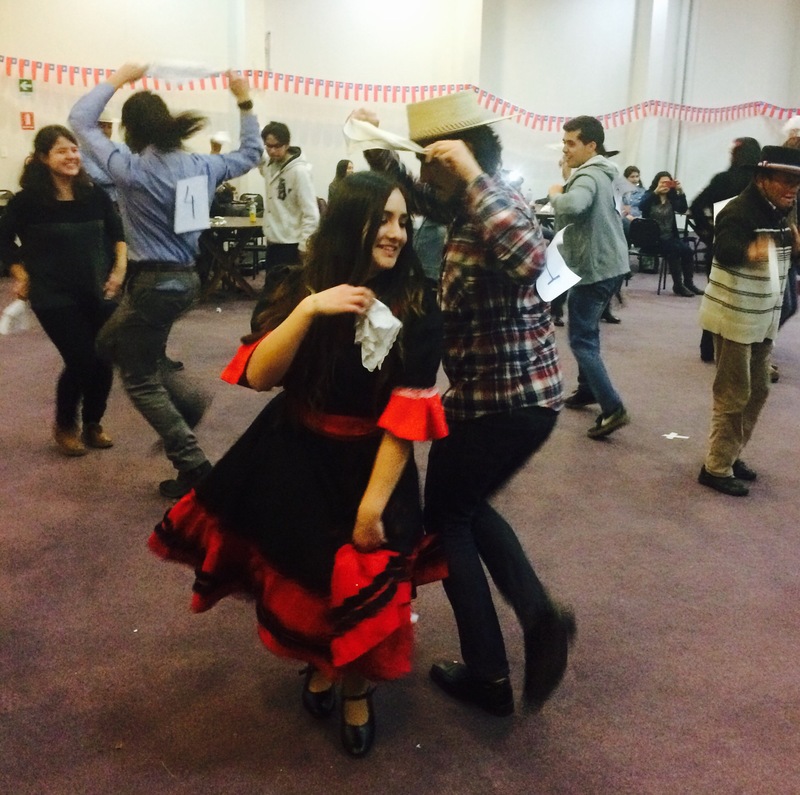 Chile’s national dance, called the cueca, is an obligatory part of every fiestas patrias celebration. For five days, the entire country gets excited about their national traditions. People dress up as huasos and chinitas, eat a lot of empanadas and choripán, and drink a lot of wine. This weekend, I went to a lot of parties where the cueca was danced. This unique Chilean dance tells the story of the conquest of a woman. It’s danced in parejas, a boy and a girl. At first, the girl acts shy. They circle around each other, coming near and turning away. The guy is supposed to follow her around and stomp near her feet. Finally, at the end of the dance, he sticks out his arm to ask for another. Most times, the girl hooks his arm in his and the audience applauds. I learned that if she wants, though, she can throw her pañuelo on the ground and walk away. 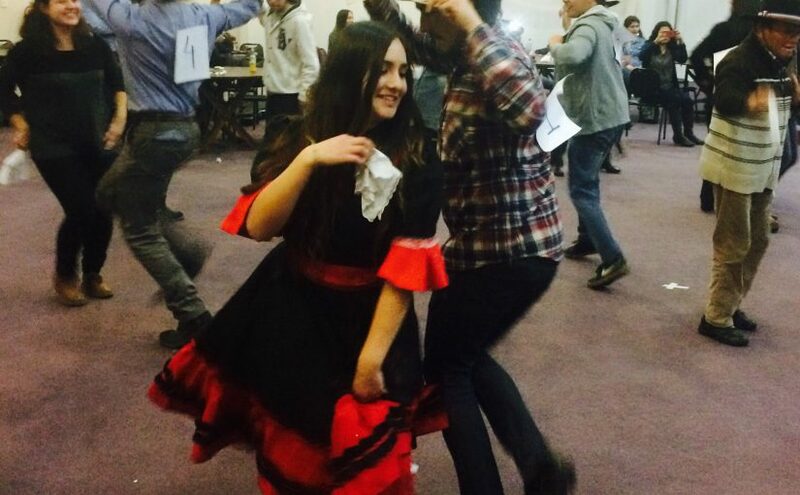 My friends Camila and Juan Pablo dancing in the church’s cueca competition. The pañuelos are an important component of the cueca. They are little handkerchiefs that the dancers have to hold in their hands and twirl around. I made sure to have my pañuelo before the festivities began, but Chileans aren’t always that prepared. They improvise pañuelos all the time. It could be a napkin, a scarf, maybe some toilet paper. In the end, it makes for a pretty unique spectacle. I love watching the Chileans stomp around, twirling their mismatched pañuelos and getting into the character of the dance. Ask me to dance, though, and I’m a little more hesitant. How do you find words to describe the Infinite? When I try to explain the beauty and majesty I saw this weekend, especially in Spanish, simplemente no hay palabras. I find myself struggling against my limits. And then the Voice inside me tells me to relax. 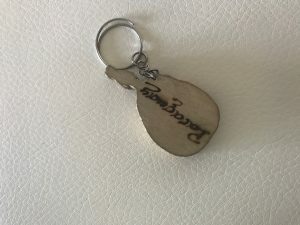 “Tranquila,” it says. “We will have all eternity to discover that.” My mind is blown again. I don’t understand the concept of eternity. But in my limits, I can wonder. What I learned this weekend is that that’s enough. Being in the most beautiful place we’d ever seen brought so much wonder to myself and my friends. 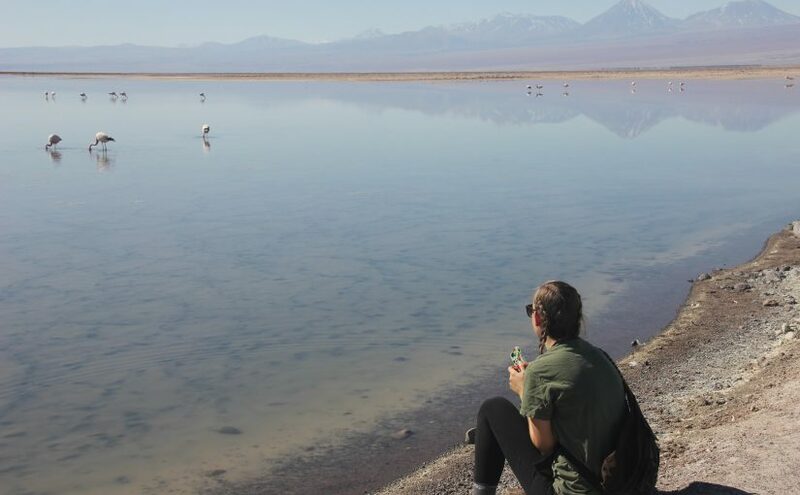 The trip was filled with exclamations of “¡Guauu!“, “¡Mira!“, “¡Qué hermoso!“, “¡Es maravilloso!” and “¡No lo puedo creer!” We could only marvel at the beauty of the Atacama desert. Take a look at my slideshow and marvel along with us! Fun fact: it’s the driest desert on earth. Being somewhere like this also makes you ponder deep questions like why we experience the sensation of beauty. My friend Erin had a very wise and interesting response. “It’s the size of this place that makes us reflect on our own smallness and insignificance.” And that’s what wonder is. It’s being surrounded by something that’s too big to understand. It’s recognizing our limits of size and understanding. If we knew everything, nothing would amaze us. If we were bigger or stronger we might not be dwarfed by the majesty of mountains. Riding around the valle on bikes made me realize how big that corner of the desert was. By the end of the day our butts were sore and legs were tired. I had pushed myself to the limit, for sure. But there was a lot of joy in recognizing my limit; it made room for appreciation of God’s creation. I think often times we try to push our limits, or forget them. In the process, we lose sight of our place in the world. Truly, we are just one second in the span of history, smaller than one grain of sand in a desert. We have a choice to recognize that insignificance, or not. Either we accept our place in the world or create a worldview that puts us in the very center. Though it takes a lot of humility to wonder, I can’t help but think it’s worth it. To me, who felt awestruck at the sights I saw this weekend, this attitude surprised me. Maybe I’m just less cultured and important than (they think) they are. But if that’s the price to recognize beauty and value in a place, I’m willing to pay it. 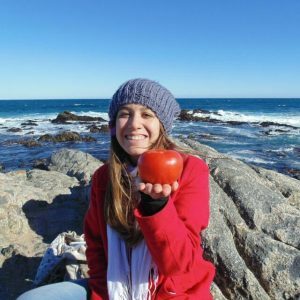 I’d much rather be like our Brazilian roommate, Sabrina, who told me, “pienso que cada lugar que visito es lo máximo”, or “I think that every place I see is the coolest.” I want her sense of wonder to see lo máximo everywhere I go. 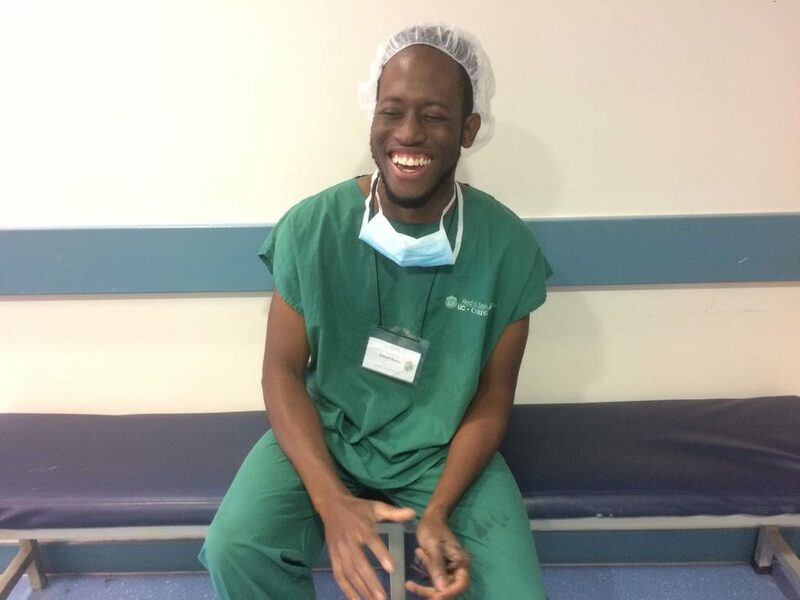 One of my most impactful moments in Chile was during one of my shadowing shifts in a local hospital. I shadowed an OBGYN in a maternity clinic. Initially, I did not know what to expect but I must say that it was definitely a fast-paced experience. After we were shown around the clinic for a tour, we saw our first patient who was entering into labor. Walking in, I noticed blood on the floor in the corner by another bed and I asked the nurse about it. I was surprised that they had not cleaned it up yet, but he told me that it was an emergency and that patient was already being moved to another room to give birth. Right after asking, he left the room to find out if we could see the birth and within minutes he was back and excited to tell us that we had clearance to go to the birthing room. Breaking into a quick stride and light jog we were already quickly headed into the room where we met the mother and the father nervously gearing up for their life-changing moment. I was nervous myself as I was uncomfortably close to the mother, who I did not know. I felt that it was a moment too precious to be shared with foreign strangers, but I was thankful that she allowed my classmate and I to observe. Once inside, we are given masks to protect our mouths and I already was breathing heavily as it was my first time wearing one and the room was getting exceptionally warm. It was a matter of minutes until she began and it felt like it all happened in just a few seconds but I was already seeing the newborn in the mother’s arms with her relieved and heart-filled smile. I look up to the father who had to step out a moment earlier to calm his nerves. His expression of relief was indescribable. It was a miracle. My face was a little damp from sweating and also from the tears that fell down my face. It was just absolutely beautiful how mothers can bring so much beauty into this world. It was at this moment that I started getting excited for when maybe I would see that beauty enter this world again and hoped that maybe that beauty would be my own child. 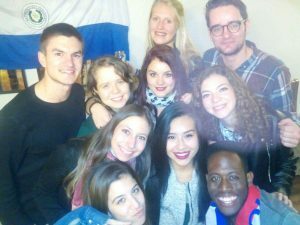 Photo at our “Despedida Paraguaya” or Paraguayan goodbye party. In the back, we decorated the wall with a Paraguayan flag with Paraguayan jerseys against the wall on every chair. Araceli, who always went by Ara, loved psychology, reading, and watching old movies. Fascinated with old film, she would always invite Vero and I to vintage film showings and we even had movie marathons. We always enjoyed talking about books, window shopped, had deep conversations about feminism and world justice and vented about our struggles studying abroad and our unreasonable amounts of homework. As I blogged in one of my first blogs, “It’s Hard to Immerse And Why It’s Okay” I talked about my difficulty finding friends of my age that I could relate to other than my IES classmates. Though I was taking classes at a local university, I only really made acquaintances which was fine and to be expected. I was always told that making friends among local students can be sometimes difficult as friend groups are pretty much set while Chileans are known to be somewhat timid when talking with new people. Though I heard this many times, I didn’t think it would really be a problem and still to this day I still think the problem was with me. I was a little scared, to be honest. I have always put unrealistic expectations on myself to speak very good Spanish and I was nervous about being teased because of my American accent. Silly, right? But luckily, regardless of this fear I ended up meeting a great group of friends that I have stayed in touch with even after my program ended. 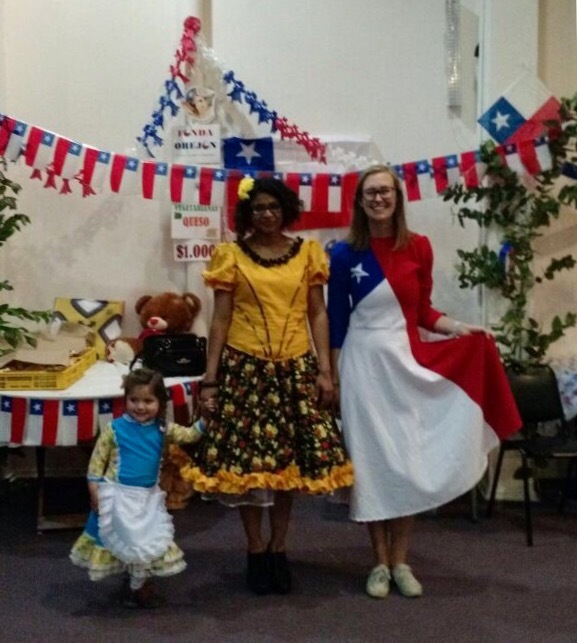 I met two of them, Araceli and Verónica, in a volunteering meeting at the local university where I took my Religion course and they were super friendly and asked everyone around them for their names introducing themselves saying they were from Paraguay. Right before I left this meeting, we ended up exchanging numbers to stay in touch about campus events that were coming up. At the moment, I didn’t think much of it since I had met many students from class and ended up forgetting their names or never hearing from them, but it was within weeks that I began to spend a lot of time with them, and eventually I began feeling like I was a part of something. They would often invite me and some of my friends to school functions and places around the city to explore. I would always thank them profusely for extending their invitations because it really meant a lot to me and even more so when they began teaching me about their culture. “Eventually I began feeling like I was a part of something”. One of the first Paraguayan friends I met in Santiago: Verónica or Vero, we would always call her. She was always super energetic and loved ballet and was always down to go dancing salsa. 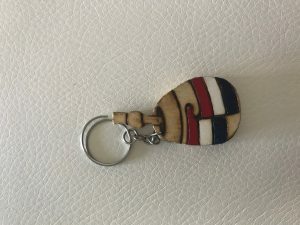 Before I left to return to the United States, she gave me a keychain from Paraguay and mentioned that she had her own from Panama (where many of family is from) so that we remember that we have a home to stay at when we visit our family’s countries. I learned a lot about their country’s second language, Guarani, which is just as official as Spanish and originates from its indigenous population. In Paraguay, these cultures are not separate but are one, as its blood flows mixed with the two. My friends Ara and Vero, who are Psychology majors, would often tell me that Guarani is important to connect with their patients. Sometimes when addressing a patient in Spanish, he or she can be closed and not as open to communicate; but as one speaks in Guarani, one can communicate more emotion and raw sentiment. It really allows for a deeper interaction. 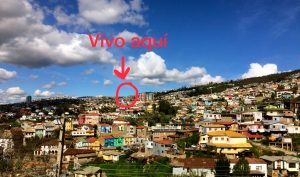 I also found Guarani to even be part of my communication with them as they taught me many words like purrete which means cool or maena which means triste or sad, or my favorite one, mopio, which we would always say after someone said something unbelievable or that was a lie. I still will never forget the first time I used it. One day I was invited to their apartment that they rented out along with other Paraguayan exchange students and they burst out laughing. At first I felt that my fear of being teased of language had been realized but they were actually laughing with me, so excited that I had been learning Guarani. At this moment, one of my friends, Sayra had clapped in glee saying that I had already become Paraguayan. A parting gift given to me about a few weeks before I left for the United States to remind me that I will always have a home or many in Paraguay. If I ever felt like I had found friends before, I felt like I had found something greater, like a second family. I truly felt home. It was where we would all vent to each other, share our dreams, bake our own pizzas, dance and watch movies until we were always reminded of the homework that was due the next day or the test we had to study for. Like all my family reunions that scheduled for a time, we would always gather at least an hour late and leave hours after we say it’s time to go. We loved food, we loved to dance, we loved to eat, and we loved to talk. To be honest, their apartment was something that of a symbol for me: that whenever I felt I needed a friend, it would be there on Calle Paraguay. To this day, I think it so ironic that the very street they lived on is named after their country, but it made it easy to find and I never had to look hard to find it. It was truly a home a way from home. It was my Paraguay in Chile. Chi Chi Chi le le le, ¡Vamos Chile! I’ve never been prouder than when I saw Chile make it all the way to the finals of the Russian Confederation’s Cup. It was a Sunday morning full of excitement as all of the streets were full of vendors selling merchandise for the game. The game was scheduled at noon so I thought that I would make it to church right before the game so made sure I caught the earliest bus headed towards Quinta Normal about 10 minutes away from my church. To be honest, I did not expect anyone to be at the service but it was the most full that I had ever seen it and everyone were dressed in red and white with team-wear. I was not able to stay for the sermon but only the worship and prayer which prayed over not only the game but also the primary elections which were taking place that very day. So, after the prayer I quickly left so that I could beat the traffic before 30 minutes before noon to make it back to my host family’s home and help prepare lunch before the game. On my return with a newly bought jersey and team scarf from the streets, I found the house unrecognizably reorganized as my host dad was cleaning frantically around the house. The TV was blaring with the pre-game interviews and analysis while I heard chanting and screaming outside. Everyone was ready and excited for the match. And within 30 minutes, it all began. All was clean and all food was set. Not a movement was made. Everyone was glued in front of the TV. Every minute was more painful than the next, giving all who watch much anxiety with every silly mistake that the Chilean team made against their young Germany opposers. Unfortunately, it all ended in a loss. It was not a shoot out like Chile’s prior match but it ended with dirty and rough play by Germany. I was crushed. I honestly wanted to cry. Never have I ever been so emotionally invested in a game. I truly felt like I was a part of it, that I would be able to witness a country that I had grown to love so much make and write its own history. Posted on September 13, 2017 September 13, 2017 Author Ismael ByersCategories CultureTags South America/ChileLeave a comment on Chi Chi Chi le le le, ¡Vamos Chile! Saturday morning started like any other would in the driest desert in the world. 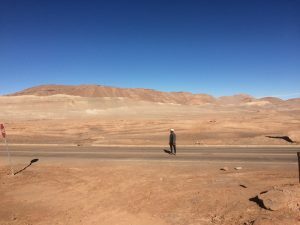 Yes, I was in the Atacama Desert of San Pedro. It was as if the desert had a thirst so severe that could never be quenched even by its recent heavy rains. 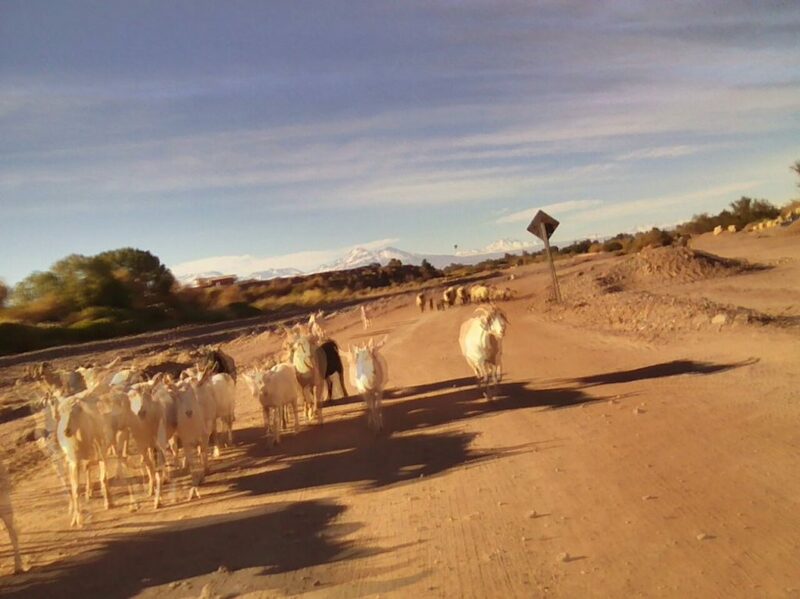 Its travelers feel the same as water is hard to come by if you aren’t in its main pueblo, San Pedro de Atacama. If the aridness wasn’t enough to make you fatigued from thirst, its high altitude would sure make you winded and short of breath as it made me on my ill-advised biking exodus on that eventful Saturday. So let’s begin my journey at 7:00 am when I woke up that morning. 7:00am – Alarm blares loudly on top of the night stand below me by the lower lower bunk in my two bunk bed hostel. Disoriented and unable to see, I stumble down my bunk and turn off my the alarm jamming my finger all over the screen until I diffuse its annoying ring. Remembering what I had woken up so early for, I quickly get ready and quietly walk out the hostel room so as to not wake up my friends sleeping. Still moving at a slow pace, I was not dressed until 7:30 am and I was out the door by around 7:50 am with my bike that was rented out until 1:00 pm that day. 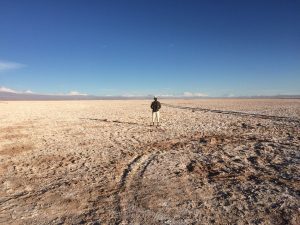 So, the idea was that I would be finished with my biking route at Catarpe park by 11:00 am with time to arrive back at the pueblo and return the bike and make it back for my next tour to Valle de la Luna. 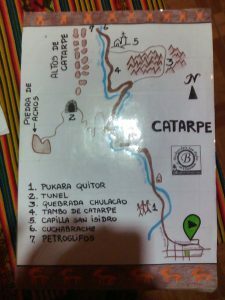 So according to the map, it would take me about about 3 hours to visit Pukara de Quitor and about 2 hours to visit Petrogupos 8 km north from the entrance. But my time estimations were completely wrong. I was barely able to get back on time. So I started biking that morning, heading for Catarpe park and the very first thing I was greeted by were a flock of sheep following a man on a horse. He greeted me with a nod and I biked in front of them. And so I continued for a brief 30 minutes until I found a fork in the road. At the fork, there were signs to head to either “el Tunel” (tunnel) or towards the chapel. So caught in between heading towards the tunnel towards the Wide Rock or Piedra de Anchos and headed towards the Saint Isidro chapel (Capilla San Isidro). And so there, my real journey began. After I followed that path, I ran into what looked like a red chasm. My curiosity peaked as I though this was the tunnel but I would later find out that it was not. At this point, the soil began to turn powdery and I was surrounded by tall red walls. Suddenly, I heard galloping noises in the distance and I scurried off my bike to find the source of the noise to encounter 4 horsemen. After taking a brief snack break, I jumped back on my rented bike to catch up with them but just as I began continuing my journey the steepness of the path began to dramatically increase making the biking unreasonably difficult so I decided that I would go on foot until I found the tunnel. Given how exhausted I was, I decided to leave my bike and lock it to the rock as I was not sure if I would encounter more steep trekking. After clearing the long dark tunnel, I see a large opening that took me about 2 hours to clear and finally find the Wide Rock which was just as underwhelming as it sounds. Disappointed by this landmark, I continued walking north until I found another opening that allowed me to see a freeway in the distance with moving dots distorted by the sun. Around me, I also found destroyed Chilean PDI police cars that seemed to have been blown up. Although wanting to continue, I decided to head back as I had a scheduled a tour to make it to. After returning to the Wide Rock the opening looked completely different and in a matter of minutes I was lost. After frantically looking for the path I took, I found a man striding speedily in the distance with a hiking stick. He had been moving so fast that I thought that he had been going at a biking speed. Afraid that I would get lost without his help, I ran has fast as I could to catch up with him. He stops as I he hears me yell for his attention and looks shocked to find another traveler on his path. He welcomed me with a hearty handshake and invited me to walk with him. As we begin walking he begins to tell me his life story, beginning with telling me that his name was Hugo and that he was lost as well. He was on his way to Alaska from the south of Argentina as a year journey and sabbatical from his life as a video-gamer in Spain. He said he was tired of his life as a gamer and wanted to pursue adventure and take advantage of his youth. He had a cheap budget that consisted of spending a few dollars a day on yogurt, water, and ham and cheese sandwiches and was hoping to make it last for the entire trip towards Alaska. I told him about my reasoning for being in San Pedro and explained that I was studying abroad and that I wanted to go on one last trip. And so, we continued talking for the next few hours until we began to find ourselves even more lost. Certain that we could find the way back to the tunnel, we were even more lost within an hour so we tried several times to climb up higher points to scope out any other travelers. Luckily, we found something in the distance on a high path. Shouting loud for help, it stopped moving. Jumping down from where we saw it, we ran up to whom we found out to be be a traveling woman. It was my hostel host. I could not have been so relieved and surprised. Calling out my name before I could make out her identity she asked if I was lost. I answered with little breath, yes and that I needed to take Hugo to the tunnel and she just pointed to her right as the tunnel was sitting right below us. And that is how I was saved from desertion in the desert. 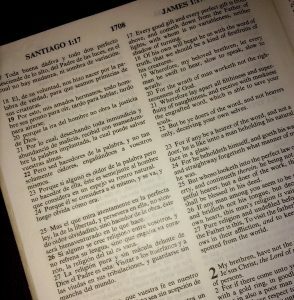 My host mom has a Spanish-English Bible, which I think is great. But the translation is definitely more old-fashioned than what I usually use. If you know my personality, you know that I am often a better listener than talker. I’m slow to contribute to conversations, and it seems like when I do speak, my words come out jumbled. In Spanish, this is ten times worse. When it comes to Latin American poetry, though, my vocabulary is impressive. The words you learn in Spanish class (like dictatorship, military coup, and communism) don’t come up in daily conversation as much, however. Oddly, I’ve come to appreciate the limits of my Spanish. I’ve also come up with strategies to get around them. But, you know what, listening is an important skill. James tells us to practice listening and practice being slow to speak. I came to Chile not knowing anything about the culture. Sure, I read up on some history, but I still have a ton to soak up. Which is why I need to listen to people and hear their perspectives. 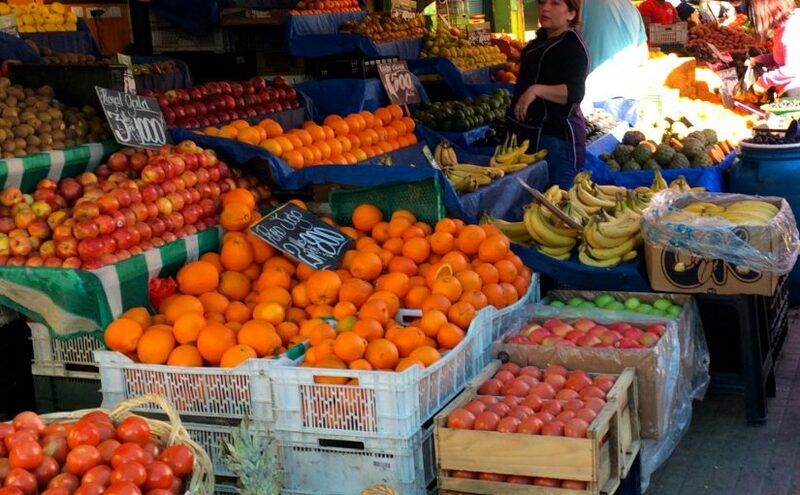 Luckily, Chileans are buenos para hablar– they’ll talk your ear off. 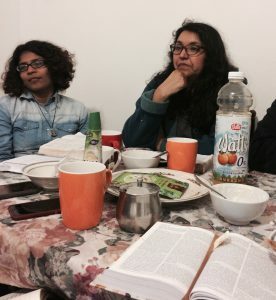 A candid taken at my weekly Bible Study/communidad. On Wednesday, when that verse from James came up in Bible study, my Chilean hermanos took it as a challenge. For me, I’m already living the challenge. I’m thankful to God for the way He’s using this experience to make me better at listening and forcing me to be even slower to speak. After all, that’s why we have 2 ears and 1 mouth. I’m a bad vegetarian. I’m not Catholic, but I’m feeling a need to confess. This last month here in Chile has really tested my commitment to my self-imposed dietary guidelines, and truth be told, they haven’t stood up to the test. 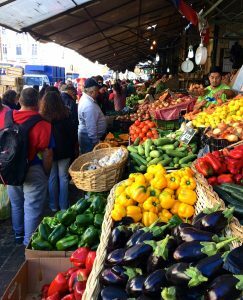 I have three (kinda funny) examples of the challenges of being a vegetarian while traveling. Ready? Here we go. I guess I’m not the strictest vegetarian to begin with because I’m ok with eating fish. Especially here, in a seaport town, I’m not opposed to a little fresh salmon or ceviche. So, when my host aunt/sister Flo texted me that she was gonna order in sushi for our anime night, I was all in. It didn’t even occur to me to mention that I was a vegetarian (or pescatarian). What more is in sushi than a little bit of fish? In Chile, it’s common to have sushi with chicken or pork. Flo ordered us “handrolls” which had cream cheese, avocado, and a few massive hunks of chicken, all wrapped in rice and seaweed. It wasn’t even cut up in little slices, which I thought was funny. That’s the most distinctive thing about sushi, right? 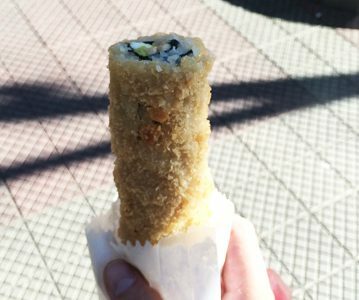 This isn’t THE handroll that confused me on anime night, but it’s a pretty good example of what sushi in Chile is like. I felt bad when I realized what had happened. And I was too hungry to make a fuss about a little bit of chicken, not when she had ordered me some yummy sushi. So I ate it, and it was good. Sushi here might not be what I’m used to, but it’s funny. I was glad to have discovered a cultural quirk of Chile. Mixing cultures always ends up being entertaining, and I guess a bit weird. 2. Completos. 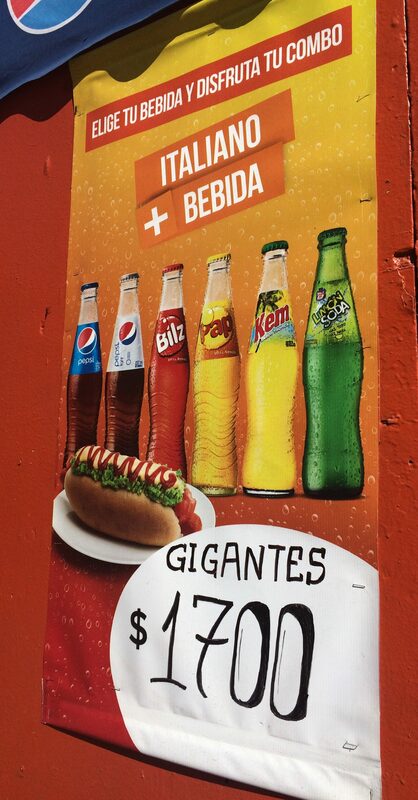 The Chilean hot dog. Here’s another cultural mash-up. Imagine an extra-long hot dog slathered with mayonnaise, and topped with an entire avocado, mashed-up of course. Add your typical ketchup and mustard and, if you’re feeling adventurous (or just particularly German), sauerkraut. There you have a completo. After about two weeks of hearing my gringo friends get excited about this culinary discovery, I was feeling intrigued and interested enough to try a completo for myself. It wasn’t like I went looking for one though. An opportunity fell in my lap one afternoon when I was working on a marine biology project with my Chilean lab group. It was late afternoon, and we were all starving. Usually in Chile, people eat almuerzo (lunch) at 2 or 3 pm, but once the clock hit 4, we gave up working on our project, resolved to meet another time, and jumped on the bus to Sergio’s favorite completo place. They were really excited for me to try my first completo and since there was a special deal that day (2-for-1) Sergio bought me two, convinced I would love it. An advertisement for a completo and drink. Only 1700 pesos! For a hot dog, it was amazing! A completo is the perfect twist on the American classic. Though I wouldn’t eat it regularly, I’m really glad I tried the completo with my Chilean friends. Since then, I’ve had a couple completos without the hot dog (the meat part isn’t the best anyway), but I don’t regret trying it the authentic way first. Did you know that here, people spend Christmas barbecueing on the beach?! And they’re jealous of us for having snow! Personally, I would trade the freezing Michigan winter for a Christmas asado. Here, we’re reaching the end of Chilean winter. Which I guess means it’s asado season. My friend Sergio invited me again to try some authentic Chilean meat. And I said yes. We went to his house in a little beach town about 30 minutes away. Then we started cooking. I loved how everyone got involved in the process, but I felt a little useless because one of the tasks I was given was peeling tomatoes. I had to admit I had never peeled a tomato. My friend Jean on the beach after our asado. About 2 hours later, the pinchos were on the grill. I wish I had a picture, because the amount of food there was impressive. And the meat was rico and juicy. I had at least 7 skewers. Not to mention the multiple salads, soup, rice, and bag of potato chips I munched while waiting for the meat to roast. On the bus ride home, I had an awful stomachache. After that pound-of-meat shock to my system, I think I’ve learned my lesson on staying vegetarian. Sometimes it might be worth it to break it, but I think from now on I’ll stick to salads and veggies to keep my tummy happy. As I blogged in a previous post, I was part of a health-studies clinical observation program as a part of the IES Abroad program. 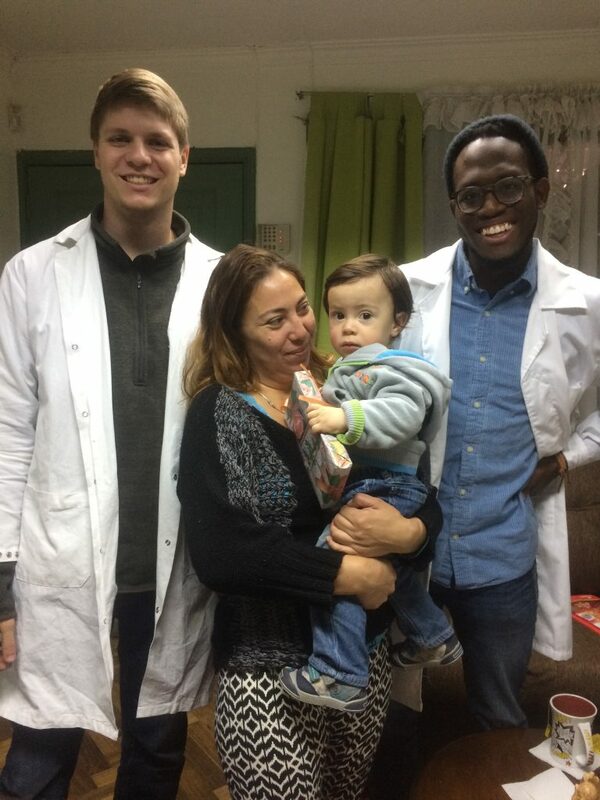 In this program, we have a Medical Spanish course that meets 3 times a week, a biweekly public health seminar course and a weekly field placement. 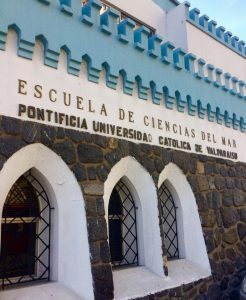 My field placement was under Pontificia Universidad Católica de Chile’s School of Nursing. Initially, I wanted to sign up for public health placement for health education but due to limited spots, I did not get the placement. Luckily, the clinical observations placement that I was put in was much better than I expected. 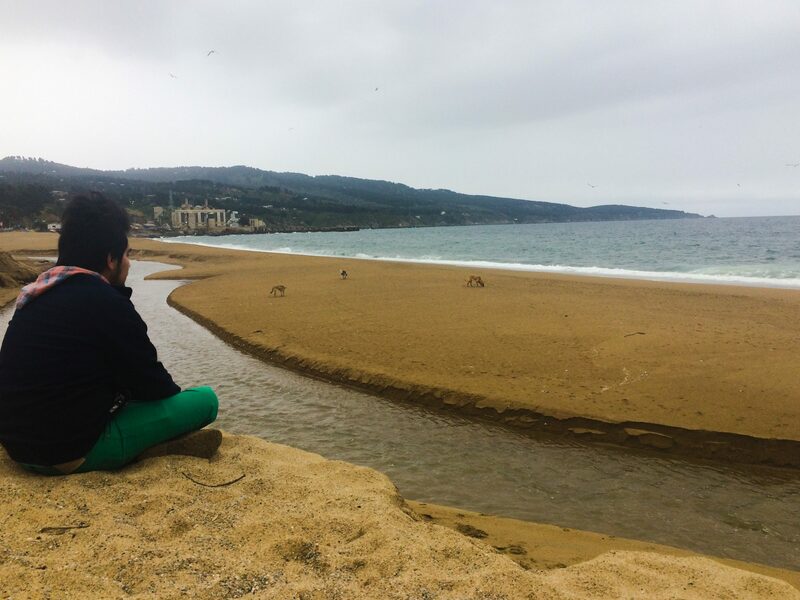 Rather than only shadowing nurses and doctors, we were able to assess several health systems ranging from substance abuse rehabilitation homes to visiting indigenous Mapuche machi (Mapuche healer). 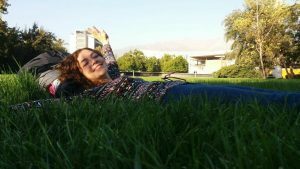 It definitely sparked an interest in both medicine and public health for me as it allowed me to even co-write an article on alternative and complementary medicine implementation in Chile’s healthcare system. But if I were to state some of my most impactful experiences of the program, I would say that witnessing my first birth, visiting a Mapuche ruca and a woman’s abuse rehabilitation home, along with watching 4 surgeries in one day were some at the top of the list. 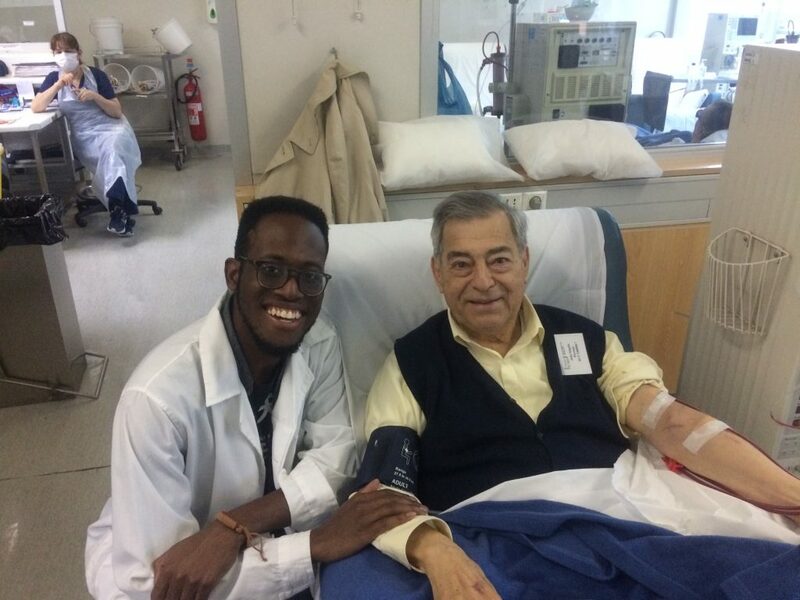 To those who are interested in medicine and are hoping to study abroad, I would highly recommend doing this program as it will also give you tools to serve patients in Spanish and gain a global perspective on medicine. Below, I have some miscellaneous videos and photos from the program. For privacy purposes not many could be taken during my experience. 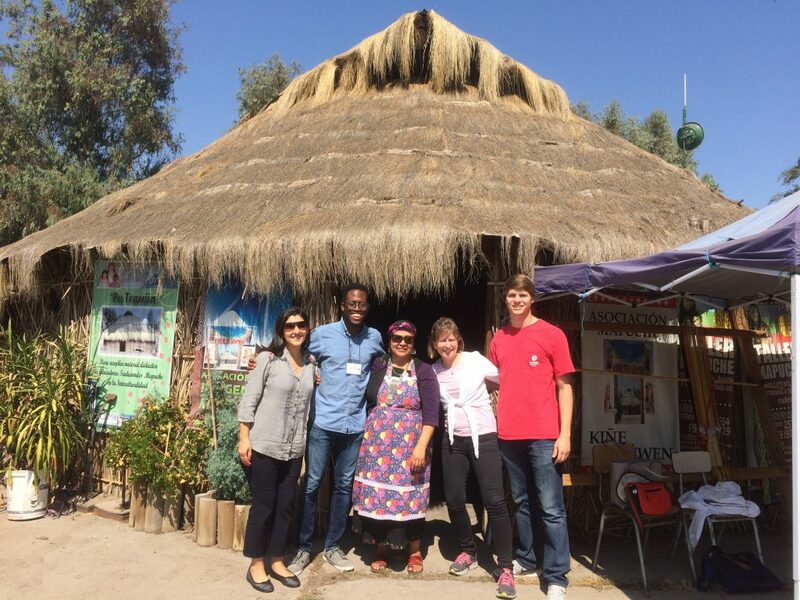 Visiting the Mapuche ruca where we were shown many medicinal herbs that are used to alleviate certain illnesses. Visiting a dialysis clinic. Met a patient that visits clinic for his dialysis regularly and returns home after. Unlike him, many other patients are on dialysis permanently and are unable to leave the clinic. My friend Luisa has a very sensitive nose. This is one of the first things I learned about her when we met three weeks ago. She sampled my gnocchi and told me it had hints of sweet potato in it. I had no idea. Luisa’s nose has come in handy various times, like when we were in Santiago and she warned us to stay clear of a marijuana-smelling alleyway. Or that time when she recognized the scent of Peruvian food just out the window and we spent the rest of our class period gazing longingly outside. Her uncanny ability to distinguish scents has got me thinking about the smells of Valparaíso. It is a city with a lot of different scents I’m grateful to experience. Now, where to start? 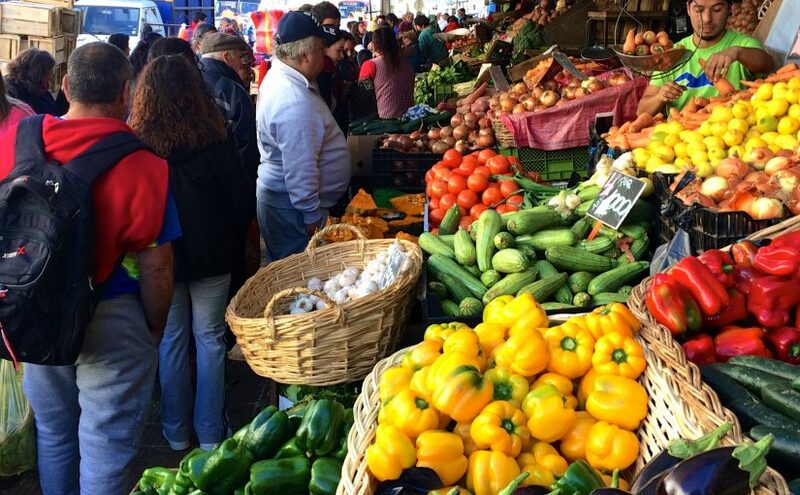 This is the big outdoor market in Valparaíso. 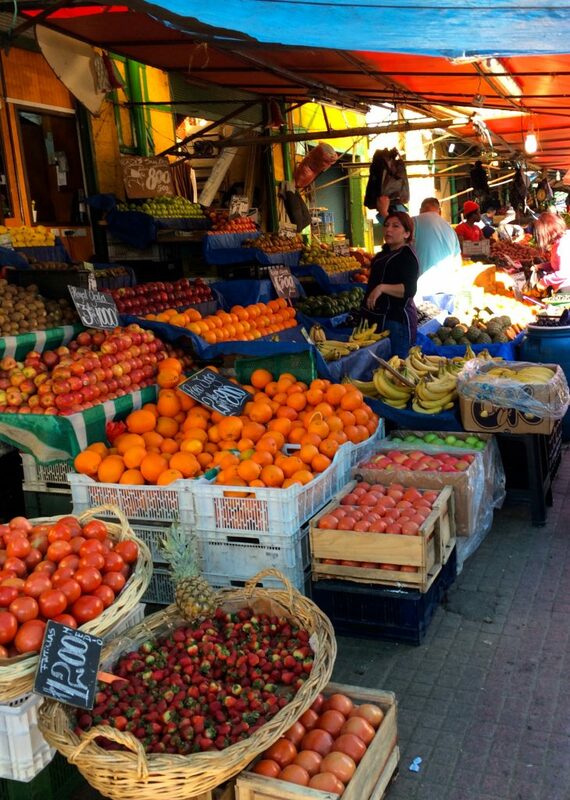 Although a part of it is indoors, the market sprawls out across the neighboring streets until cars can no longer drive through, and every inch of sidewalk is covered with piles of fruit and vegetables, or vendors selling empañadas. I walk by on my way to class, and I get a whiff of fresh lemons. Another day, it’s bananas or eggplants that are the freshest. The problem with the streets of Mercado El Cardonal is that at night they become dangerous. It’s a place where lots of drunks hang out. So, combine the smell of alcohol with some piss and leftover garbage scraps rotting in the gutters, and it’s not the most pleasant scent. To be honest, I’d recommend visiting during the day. My marine biology class is in this building, and it’s my favorite because it looks like a castle. Plus there are often sea lions lounging around on the nearby rocks. 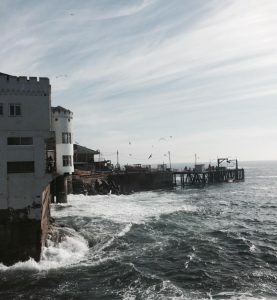 We get the smells of the ocean here, a salty misty spray might even hit you if you’re studying on the outdoor patio. There’s also a large fish market nearby, so every time I come back from Escuela Ciencias del Mar, my clothes smell like fish. It’s really fresh though; the mariscos (seafood) here is the best! 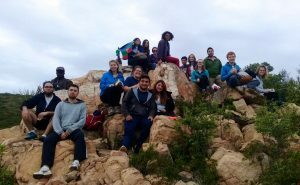 Today we hiked up a very steep “hill” about an hour away from Valparaíso. 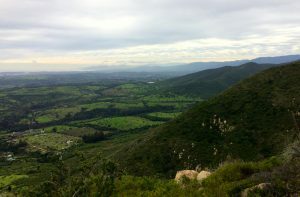 This area was home to the indigenous picunches, before being conquered by the Inca, then the Spaniards. In their native language, mau means suspended and co means water; the suspended water the name describes refers to the low-hanging clouds. While we were up there, we got a refreshing scent of rain, though the shower only lasted a few minutes. The flowers along the way also gave a pleasant aroma, and as my friend Pablo remarked, “el aire huele más fresco arriba” (the air smells fresher up here). This is the hardest scent to describe. It’s definitely a homey smell, and when our nana, Elisa, is there, the kitchen is filled with delicious aromas of whatever she’s cooking. The house is always spick and span, so I’m sure the cleaning chemicals contribute, and I know the laundry detergent we use is Ariel. The funny thing is, I think I’m starting to lose the ability to distinguish the smell of mi casa. I’m starting to smell like it. It’s become a part of me. My friends and I were talking the other day about how our houses back home don’t have a scent to us; that’s just the way we smell. Here, too, mi casa es mi casa. 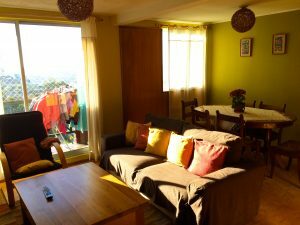 My house in Chile has become my home.